Two obtuse gym employees discover a disk that they believe has classified government documents within it and intend to sell it. Meanwhile, the owner of the documents has quit his job as a CIA analyst having decided to write his memoirs and is facing a unexpected divorce from his wife. His wife has been having an affair with a married Treasury agent, who is also dating one of the two gym employees. 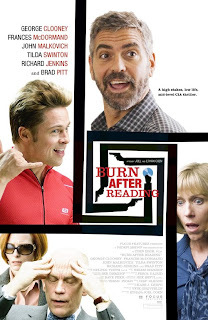 Burn After Reading is a perfect look inside a fictional and meaningless case within the CIA that really provided oustanding dialogue and hilarious characterizations. Brothers and directors Joel and Ethan Coen wrote, directed and produced Burn After Reading as flawless follow up to their Academy Award winning film "No Country for Old Men." The film is on the lighter side of the Coen's universe and dabbles in the idiocy of it's characters all to well. The story is light and whimsical and the performances by its all star cast carries the film to its startling and simplistic climax. Like in any great Coen film, it is character driven and Burn After Reading does not disappoint. It is very rare that every member of a cast provides such remarkable performances, but more times than not in a Coen film, the cast comes off brilliantly. Every member of the cast is so dynamic and perfect in their character acting that the film becomes a complete joy to watch with the likable and intriguing characters that really deliver throughout. George Clooney has worked with the Coen's two other times prior and this film has created "the trilogy of idiots" for Clooney. His character Harry Pfarrer is an absolute riot. From his passion for what he calls a "Hobbyist" to his worry of certain foods because they may cause a reaction in his throat, Clooney nails every aspect of his character. Lastly, Pfarrer's building paranoia is outstanding and really adds to the overall spy caper within Burn after Reading. Brad Pitt's first crack at a Coen film is flawless. His portrayal of a idiotic but extremely submissive gym employee Chad Feldheimer was undeniably hysterical. His mannerism's, constant need to be moving and stay hydrated, his simplistic almost childlike understanding of what he has gotten himself into was brilliant. Furthermore, Chad's wardrobe was perfect and his constant bickering when Linda Litzke (Frances McDormand) would make him wear a suit so that he would blend in, was side splitting. Pitt's performance was laugh inducing time and time again throughout Burn After Reading and will go down as one of his more memorable characters. John Malkovich as Osbourne Cox probably delivers the most consistent laughs throughout Burn after Reading in a perfect performance of a bitter ex-CIA analyst. Watching Malkovich's character spiral envokes pure hilarity and really brings a smile to the viewer's face. His wife/ex-wife played the ice queen herself, Tilda Swinton is an impeccable personna of her dark character throughout the Coen's black comedy. Frances McDormand in her second Coen film is also perfect as Linda Litzke. Her character is unsatisfied with her body and desperately wants to have some cosemetic surgery to perfect her body. She is also desperate to find someone to share her time with and delves in internet dating to try and find the right match. All the while, she is completely oblivous to the fact that her boss at the gym is madly in love with her. The determination of Litzke provides the most laughs to her character who, like Chad, is bewildered and in over her head with the information they believe to be highly classified. Her lack of knowledge and simplistic nature is very funny and helps to deliver one of the oustanding collaborative performances in Burn After Reading. Outside of the brillaint characterizations in Burn After Reading the simplistic and whimsical nature of the film and story telling really provides a breath of fresh air. Too many films these days have been so heavy hitting and have had such dramatic impact, it's nice to see a film that doesn't take itself too seriously. The Coen's themselves provided a heavy hitter last year and followed it up with a much lighter film that still really delivers on content no matter how unsubstantial the tale may be. Finally Burn After Reading is a great spy film that has a light-hearted plot that pays off in its characters and their performances. The Coen's body of work is absolutely excellent and Burn After Reading is a perfect addition to their library.